“All my life I have dreamed of martyrdom.” This is what the founder of Hamas resistance movement used to say before his assassination by the Israeli occupation army. Thus in killing the spiritual leader of the Islamic Resistance Movement, Israel may have granted Sheikh Ahmed Yassin (1937 – 2004) his greatest wish – and made him an ultimate symbol of the resistance path in the whole Arab world. Sheikh Ahmed Ismail Hassan Yassin was born in the village of Al-Jora, Majdal district, in 1938 and sought refuge alongside his family in the nearby Gaza Strip following the 1948 Nakba or the usurpation of most of Palestine by the Zionist entity. Sheikh Yassin was paralyzed in his youth when he was 12 years old as a result of an accident while exercising on the beaches of Gaza. He worked as a teacher of Arabic language and Islamic religion then as a preacher and teacher in the Gaza mosques. He turned into one of the most vociferous and most famous preachers in the Gaza Strip following its occupation in 1967. He was married and raised 11 children in a three-room apartment in Gaza City slum. He also worked as a chairman of the Islamic Complex in Gaza before his arrest in 1984 for possession of weapons, establishing a military organization and championing the annihilation of the Zionist entity. Sheikh Yassin was court-martialed and the Israeli judges passed a 13 years prison term against him. He was released in 1985 in line with a prisoners’ exchange deal between the Israeli occupation authorities and the Popular Front for the Liberation of Palestine – The General Command after spending 11 months in prison. Sheikh Yassin founded the Islamic Resistance Movement, Hamas, along with a number of Islamic activists in the Gaza Strip in 1987. Israeli occupation forces broke into and ransacked his house in late August 1988 and threatened to push him along with his wheelchair across the borders into Lebanon. On the evening of 18/5/1989 the occupation authorities arrested Sheikh Yassin along with hundreds of Hamas activists in a desperate attempt to curb the armed resistance that started to take the form of attacks on settlers and occupation soldiers. On 16/10/1991 an Israeli army court passed a life sentence in addition to 15 years imprisonment sentence against Sheikh Yassin after an indictment list leveled nine charges against him including inciting the capture and killing of Israeli soldiers and the establishment of the Hamas Movement’s security and military wings. Sheikh Yassin was held from May 1989 until October 1997, when he was released in exchange for two Mossad agents following an aborted assassination attempt of Khaled Mashaal, the politburo chief of the Hamas Movement, by the Mossad in Jordan. Sheikh Yassin survived an assassination attempt on 6th September 2003 when Israeli Air Force F-16 fired several missiles on a building in Gaza City. He was lightly injured in his right arm. Despite the Israeli assassination attempts, Sheikh Yassin made no effort to guard himself from further attempts on his life or hide his location. Journalists sometimes visited his residence in Gaza and he maintained a routine daily pattern of activity, including being wheeled every morning to a nearby mosque. On 22 March 2004, Israeli helicopter gunships fired missiles at Hamas’ spiritual leader, Shaikh Yassin, as he left a mosque after performing the Monday dawn prayers, killing the Hamas leader and both of his bodyguards. They were killed instantly, along with nine bystanders. 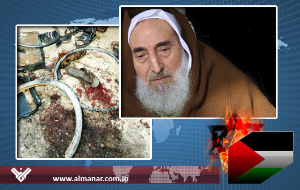 Another 12 people were injured in the assassination, including two of Sheikh Yassin’s sons. Israeli security sources said then-Prime Minister Ariel Sharon personally ordered and monitored the helicopter attack against the paralyzed Hamas leader. Hamas said it believed Washington had given the green light for Sheikh Yassin’s assassination. It was the highest-profile assassination of a Palestinian since the April 1988 killing in Tunis of Palestinian commando chief Khalil al-Wazir. The strike at Sheikh Yassin was not completely unexpected. Following a double martyrdom bombing the week before at the Israeli port of Ashdod that killed 10 settlers – the first successful Palestinian strike at a major piece of Israeli infrastructure – Sharon’s government had reportedly decided to renew the targeting of senior leaders of Palestinian resistance groups, a policy it had quietly put on hold. The strike also seemed to be aimed at weakening Hamas to prevent it from claiming victory should Sharon go ahead with a planned unilateral pullout from Gaza. Israeli then-Defense Minister Shaul Mofaz, speaking to reporters, called Sheikh Yassin “the Palestinian (Osama) bin Laden” and pledged more Israeli attacks on Hamas’s top echelon. Previous assassinations of Palestinian resistance leaders have triggered waves of martyrdom operations that have turned Israeli buses, restaurants and cafes into charred wrecks and deepened violence that has stalled a U.S.-backed so-called “peace road map”. The Palestinian Authority declared three days of mourning and closed Palestinian schools. Hamas official Ismail Haniyyeh suggested, “This is the moment Sheikh Yassin dreamed about”. The Hamas leadership said Ariel Sharon had “opened the gates of hell” and called for retaliation against Israel. About 200,000 people took to the streets of the Gaza Strip for Sheikh Yassin’s funeral as Israeli occupation forces declared a national alert. Abdel Aziz Rantisi was announced as the new head of Hamas. At a memorial service for Sheik Yassin, he declared that “The Israelis will not know security… We will fight them until the liberation of Palestine, the whole of Palestine.”Publicly addressing the “military wing” of Hamas, Rantisi suggested, “The door is open for you to strike all places, all the time and using all means.” Rantisi was himself assassinated by Israel on 17 April 2004. Sheikh Yassin, other than his complete paralysis, suffered a number of other disabilities and diseases including loss of eyesight in his right eye due to Israeli blows during interrogation in addition to weakness in his left eye. He also suffered from chronic inflammation in his ear, lung infection and other diseases in his abdomen. His detention in jails further worsened his health conditions, which necessitated carrying him to hospital on numerous occasions. However, this great paralyzed leader had asserted that Palestine is an Islamic land “consecrated for future Muslim generations until Judgment Day” and that no Arab leader had the right to give up any part of this territory. Sheikh Yassin’s declaration that “We chose this road, and will end with martyrdom or victory” later became an oft repeated mantra among Palestinians.